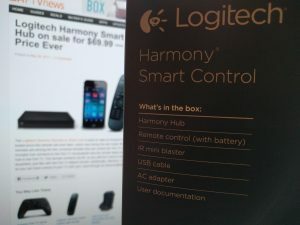 The Logitech Harmony Remote w/ Smart Hub is back on sale on Amazon for $69.99. This matches the lowest price this remote has ever been, which was during the last Cyber Monday sale. Harmony remotes are among the few universal remotes that can control the Fire TV and Fire TV Stick. The included hub connects to the Fire TV via bluetooth and the remote relays button presses through the hub to the Fire TV. The remote connects via RF, so you still don’t have to physically point the remote anywhere, just like with the Fire TV default remote. Additionally, Harmony created a pair of Alexa Skills, so you can have control of your TV with your voice through an Alexa-enabled device. Yes, it does include the hub. Read the description. Same price at BestBuy today. Just wanted to say I bought this earlier this month when you advised us it had gone on sale, and I’m glad I did–wish I’d done it years ago now. It was out of stock when I pulled the trigger, but I still got it within a week. The remote is great for family members who just want to do the basics, and the App interface is mainly for me when I want/need to perform more complex tasks. The app also permits swiping gestures to perform the most common tasks, so my initial disdain (I don’t want to look down at my phone when I’m watching a movie…) was mostly unfounded. The only real downside I see to this bundle is that technically it is discontinued, replaced by the Harmony Companion. The Companion ads some poorly reviewed home automation features, but comes with a new remote who’s button placement is superior to this one’s, but not $70 worth–IMHO. I’m glad you enjoy the remote and thanks for chiming in with your experience. Note that pressing home twice at first is necessary in case the screensaver is going, since the first home press takes you out of the screensaver but doesn’t load home. If you have an Echo or Echo Dot, this also allows you to say “Alexa, turn on Netflix” for example, to launch the apps. i had not though of this configuration, but it is genious!!!! i love this controller, since it allowed me store 4 controllers in the drawer (TV, FireTV, SoundBar, HDMI Switch). wish there was a way to actually have it create a shortcut to the app like the fire tv control app allows you to do..
@oppman29 Some Kodi skins do let you set them up not to loop. You may have to go into advanced or expert mode. Or to the skin’s settings menu to find the switch that toggles it. Hope this is helpful.